Cream peanut butter, butter, and both sugars. Sift together flour, baking soda, and salt. Add to mixture. Blend to make a dough. Shape into 1/2 inch balls. Place in an ungreased 1 1/2 inch muffin tins. 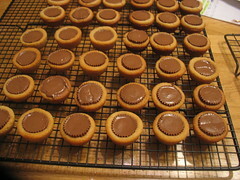 Immediately after removing from oven, press a peanut butter cup into the center, deep, until only the top shows.